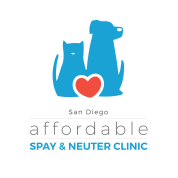 the Original Affordable Spay and Neuter Clinic of North County San Diego! You will receive an email with the drop off time and instructions for surgery within 24 hours of submitting the form. Please call us if you haven't received our confirmation email within 24 hours. **Elizabethan Collar - $10/small $15/medium or large (prevents licking incision site) **Extra Care Package - $30 (includes antibiotic injection and IV Catheter and IV Fluids during surgery) (Required for pets over 2 yrs of age, pets over 40 lbs, and may be required by the doctor for other pets for heath/ safety reasons) Antibiotic Injections - $15 (helps prevent post op infection) I will decide on the day of surgery OR I decline any/all recommendations.